Day#3 of 12 Starts NOW! This prize contains all of the Love & Lace papers, Love & Lace combo sticker, Love & Lace Noteworthy, Love & Lace Buttons, Love & Lace layered chipboard, Love & Lace 6×6 paper pad, stickable stencil, glimmber spray, glitter paste, pearlescent, lasercut chipboard, jewels, dies, foil medallions, & glitter & foil chevron stickers. This prize package is valued at well over 70$ and is FULL of everything you need to keep your projects sticking together! Thanks for a chance to win- My scrapbooking friends and I share our products but any help we can get is appreciated. Some of those materials are pricey! Day 3 and more wonderful giveaways. Thanks to Bo Bunny and Scrapbook Adhesives – would love to win wither of these prizes. Thank you for the opportunity to win a prize. Merry Christmas. Thank you…looking forward to scrapping in the New Year. Oh me, oh my!! The gifts just keep getting better and better!!! Left love for todays’s sponsors on FB! Thanks for the chance to win such amazing prizes! Day 3! You guys are so awesome to do a giveaway! oooo paper and adhesives. What a combo. Thank you. Oh I love BoBunny and Scrapbook Adhesives by 3L! I’m gonna go leave them some love! Thanks for the chance to win! Can’t forget to enter for the second prize! Thanks for another great opportunity! Thank you for the opportunity to win some incredible prize packages! Merry Christmas CSB! More awesome prizes on Day 3! You rock! Lovely prizes!! I left them some love on fb! Thank you for the generous giveaways! Both prizes are fabulous! Thanks and Merry Christmas! Another great stash of prizes. Thanks for the chance to win! I’m still new to papercrafting, so papers and adhesives are a must to increase my stash and variety of things to work with. I am so low on adhesives….just in time. I sure would love to win this one. I love Bo Bunny!! Thanks for the chance to win this amazing prize! Wonderful ideas each & every day! Love Bo Bunny! And more adhesive is always a good thing! Thank you! I love Bo Bunny, my favourite ,thank you CS. Such great prizes! Anyone would be excited to win. Thanks for the amazing giveaway. Merry Christmas! oh my gosh oh my gosh!! swwwwoooon. Amazing giveaway! Thanks for the chance to win! Merry Christmas to all! Wow! This is such an amazing giveaway, can never have too many scrapbooking supplies! Wow, it’s a dream come true – beautiful papers and great adhesive! I love love love Bo Bunny and Scrapbook Adhesives makes this an awesome twosome!!!!!! Love these products! Thanks for the chance to win! I love BoBunny and Scrapbook Adhesives! Thank you! Scrapbook Adhesives is my most favorite!!! Love their product. Thank you for the opportunity to win. Love the BoBunny – so colorful. 3L is always in use in my house. it’s so sticky for all those times you want your embellies to stick. Love this time of year, and the giveaways too, thank you! Would so love to have BoBunny!! Wow, what a great opportunity. Thank you! Simply amazing prize package. Thank you CS, Scrapbook Adhesives and BoBunny. What wonderful prizes! My! The creating that could happen! What wonderful prizes! Thank you for the chance to win! OH my, what an awesome gift!! SQUUUEEELLLL!.. I was hoping for some Bo Bunny in there! I’m such a fan! And SA—OMG! who doesn’t love their stuff..best ever! Thanks for the chance to win!. Such awesome prizes! Thanks for the opportunity! Goodies!!! These are both beautiful packs! Wow. Would love to win. Thanks. Happy Snow days. Be still my heart, look at that sweet Bo Bunny prize!! And all the best adhesives to put it together with! Thanks CS, Bo Bunny and 3L for all the chances to WIN! Amazing prizes! thank you to our sponsors and thank you for the chance good luck everyone!! Mo Bunny, mo Bunny, mo Bunny! ???? awesome day to win !! thanks for the chance to win! Wow…what great prize packs, thank you! Thanks for this wonderful opportunity! What’s not to live? I’d love to win!! Thanks. Day three done, love both these sponsors! Thanks for another great day of prizes! I said hi and liked. What a great prize pack! Merry Christmas! You ladies work so hard to bring the best for all of us! Thank you! Thank you Canadian Scrapbooker and all of these fabulous sponsors. I love Bobunny so much! They make products that are fun and extra special. These adhesives look awesome too. Wow, awesome prize! I need this! What a wonderful prize! Thanks for the chance to win!! Wow! Super duper prize packs. Love both of these companies!! Awesome giveaways CS!! 12 days of Giving. How exciting! Amazing prizes today! Thanks for the giveaways. Awesome giveaways… thank you so much! BoBunny kits are my favorites! Love, love, love all Bo Bunny products. That’s a great haul. Because I do card making, scrapbooking and mixed media art I go through a ton of adhesive so that’s a prize I would use as well. Awesome prize packages. Love the products and thanks for the wonderful giveaways! Love all the prizes giveaway…such a wonderful packs of crafty goodies! fingers crossed I win one of these awesome prizes! Great prizes by everyone who has contributed to your 12 Days of Giving! What an awesome giveaway! Thank you for the chance win! What a wicked prize package!! Goodness, gracious me…. it looks like BoBunny is giving half of it’s inventory away! What an awesome bundle of goodies that have sponsored as a giveaway! …and to top it all off, Scrapbook Adhesives has included just about everything that they produce! Wowsers, very generous giveaways today! Thank so much for the chance to wiN!! Oh WOW! Day 3 is even better than day 2 with such fabulous prize packages. Love it. Who couldn’t use more adhesives and a full collection from Bo Bunny is fantastic. Another terrific prize today – CS are the best! BoBunny + Adhesives By 3L = a perfect package!! yowza—look at those goodies!!! so great! Two more great prizes to try and win. Thanks. Thank you for the wonderful prizes! Great prizes! A great addition to any craft room! Would love to win these prizes!! Thanks for the chance! this gifts are awesome! You never have enough paper or adhesive! Merry Christmas! Those BB papers look like something my granddaughters would love to see around & behind their photos in my scrapbooks. And how can we play without the sticky stuff? More awesome prizes. Thanks for setting this up! This prize is huge! Thanks for a chance to win! The 12 Days of Giving is so much fun. Visiting all the different Facebook pages to see what new products are available. And the prizes are incredible. Good luck everyone and Merry Christmas !! On the Third day of Christmas, Canadian Scrapbooker Magazine gave to me, BoBunny and Scrapbook Adhesives by 3L! Merry Christmas! I love BoBunny! And who doesn’t need adhesive? Another great day of giveaways! Thanks CS! Happy Holidays to you and your families!! 🙂 Thanks for the great magazine and give aways!! Wow these are wonderful giveaways! Merry Christmas! Great prizes – thanks Canadian Scrapbooker! Love all the great prizes! Can never have too much Bo Bunny products and love the adhesives. This is so exciting!!! Love love love this prize! Thanks! WooHoo Bo Bunny and Scrapbook Adhesives by 3L have outdone themselves again this year with their amazing prize contributions! Please put them under my tree Santa!! Bo Bunny has the best florals! Merry Christmas. Thanks for thevawesome chance to put thrse under my tree and labeled for me! ??? Delicious Prizes! Thanks for the giveaway! Thanks again for the opportunity! Loving these! Ok, I can’t stop staring (and drooling) over the Bo Bunny! OMG! LOVE!!! And adhesives. Who couldn’t do without a bunch of adhesives! Well, I think I’m late to the party! WOW, super awesome prizes, would love to win these!! Those Bo Bunny paper are gorgeous! I would love to scrapbook some of my daughter’s pictures with that paper! Thanks for the chance to win! Bo Bunny is my favorite!! Gorgeous line from Bo Bunny…. love the blue. Thanks for a change to win! You can never have too many adhesives or BoBunny packages! Great prizes today. I have left comments on both pages. Again thanks for the opportunity. First, none of us could make anything without our adhesives! Love 3L adhesives. And what an incredible prize from BoBunny – wow! Thank you again for the chance to win! The prizes last year were great, this year they are amazing. Look at all that Bo Bunny goodness! And who doesn’t love Scrabook Adhesives by 3L! Love Love Love that bo bunny! I love both of these companies and have used their fine products! Cover me with Bo Bunny and I’ll be a happy camper! What crafter doesn’t love adhesive. A gorgeous collection from BoBunny too. Another great set of prizes, thanks to CS and your sponsors. Awesome, just love it… Thanks for the chance to win. My granddaughter and I would have so much fun with these products! Great combination. All the beautiful Bo Bunny paper and the glue to put it together!! Two favourite companies today! Thanks for sharing some of their fantastic products! Love Bo Bunny and one can never have too many adhesives! Lovely collection from Bo bunny. Love it! :) Thank you so much Bo Bunny and Scrapbook Adhesives by 3L! I really appreciate your generosity.
? what beautiful paper! Such great prizes! Would love to try BoBunny items, I’ve never tried them before. Just when I think the prizes can’t get any better? They do! Holy smokes, gotta have that Bo bunny collection! I’m just getting cranked up for DT Valentine projects and oh, this would be THEE perfect paper! And Scrapbook Adhesives to boot? Yes! Thank you so much CSM and sponsors! I love bo bunny and lots of adhesives! Great day of prizes! BoBunny and adhesives! Thanks for the chance to win one of these great prizes! Oh wow. Would love some BoBunny and Scrapbook Adhesives products. Thanks for the chance to win. Amazing package by BoBunny! 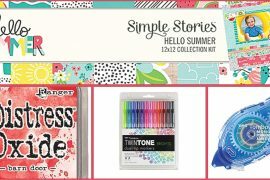 And who doesn’t always need some great Scrapbook Adhesives by 3L! I would love to win both these items today. Could always use more Scrapbook Adhesives! Two of my favorites, thanks for a chance to win! I am already thinking of the beautiful things I could make with just these two prizes!!!! Awesome!!! Thanks for the chance to win!!!! Fantastic prizes. Love Bo Bunny and I really love Scrapbook Adhesives. Such great quality! Thanks for the chance. Wow!! And wow again!! The BoBunny prize pack is Amazing!!!! Also love that Scrapbook Adhesives by 3L, can’t scrap without SA by 3L. Thank you all for a chance to win. I have to say the feather stencil looks amazing!! Loving all these chances to win! What fantastic prizes!!! The BoBunny Collection will really go nicely in my daughter’s wedding album! And what better way to put it all together, than with Scrapbook Adhesives by 3L! Paper and adhesive…. a scrapbooker’s dream come true! A al can never have enough Adhesives 😉 Bo Bunny Collection will sure come in handy also! Thanks for a super giveaway! I am really starting to adore Bo Bunny products. They’re so whimsical. Love, love, love the prizes being offered! Thanks so much for all the chances! WOW what a wonderful prize pack, I’m in heaven. That is a fantastic prize offering! What a great surprise for someone at Christmas! Love Bo Bunny and adhesive! Bo Bunny my favorite.. can never have enough. Love to have all of it and more. super cute. Lovely prizes! Thanks for the chance to win! Another great gift to win! What a perfect combo – paper and adhesives. Thank you! Bo Bunny is one of my fave lines, and adhesives are a staple that you just have to have…I’m running out so would luv some! Wowow, thank you! Commented on both. what great giveaways. Thanks for the chance to enter the draws. Fingers crossed for winning today’s giveaways!!! I really need that adhesive but would also love the scrap delights! Can always use adhesive! Thanks! Love, love BoBunny and Scrapbook Adhesives! My head is spinning! So many great products for us to love, thanks once again for this opportunity! Holy Christmas! These prizes are huge! Thanks! What phenomenal packages, both of them!! Fabulous Bo Bunny and Scrapbook 3L adhesive!! Ready to scrap the holidays away!! Wow! That is a great prize pack!!! Love it! I can’t wait to get all of this great stuff! Loving this contest! Great prizes! Love Bobunny paper and scrapbook adhesives! oh adhesives how important you are! great prize! Thanks for the chance at yet another fabulous prize! Merry Christmas..what a great gift. Awesome prize giveaway. Love BoBunny products. Wow what amazing prizes. I’d go crazy with joy if I were to win this giveaway! :)) Thanks BoBunny and Scrapbook Adhesives by 3L for this amazing opportunity:)) Happy holidays. The BoBunny papers and embellishments look like so much fun. I could also really use the 3L adhesives to put together all my projects. Great prizes!! Great products. Love your stuff. Great prize of so many adhesives – you are always needing more. Would love to win these!! Thanks for the chance!! I think I spend more on glue and sticky dots than I do anything else. The Bo Bunny package is so very fabulous and incredible! Would love to win this prize! Gorgeous! Adhesives and embellishments!! Does it get any better! Wow, the Bo Bunny looks great, so many possibilities. Love the adhesives too. ooh wow. Love love love BoBunny, can’t get enough of their beautiful goodies@! Beautiful papers and a person can never have too much adhesive. Fabulous Brand! I love all your products!! Thank you for this chance to win!! Merry Christmas!! Love these two sponsors today!!! Another great giveaway, so generous. Another super sensational prize pack. Love the great prizes. Merry Christmas! Oooh, Bo Bunny and adhesives are all I need to keep busy and happy!! Wonderful prizes! WOW!! I love 12 Days at CS!! Thanks for all the giveaway prizes! Love all the prizes. Christine S.
BoBunny and Scrapbook Adhesives – Thanks for the chances! This is the cat’s meow, love it all!! Wonderful combination today! Thanks for the chance! Wow, I think you have outdone yourselves this year! Hi to CS!!! You are TOO great to help sponsor this giveaway!!!!!! THANKS so much! More awesome prizes! Thanks for the chance to win! Awesome! Tks for the chance! Bo Bunny has remained a forerunner in the industry! One can never have enough adhesive so this is a doubly great prize! Love Bo Bunny papers. Never can have enough paper or adhesive. This is a prize everyone can use whether your a scrapbooker or card maker–then there are those like me who loves to do both. Love adhesives … Who doesn’t need more? I just like saying it! I love love love BoBunny! The must have of supplies-adhesive! Another wonderful prize pack. Bo Bunny products are consIstently a favourite. And of course always need adhesives! Merry Christmas “Bunny”! Love Bo Bunny products! Thanks and Merry Christmas, this would definitely make my Christmas. Would definately need all of that adhesive for the fabulous Bo Bunny prize package! Great stuff – That BoBunny prize is huge! My two favorite products– Anything Bo-Bunny and adhesive!!! Fabulous combination of prizes…love the giveaways! Wonderful prize package…BoBunny is a favourite! Thanks! I just love these companies because they have such awesome products! I would love to win these great products! I could really use them! Thanks!